Kid’s Marching Parade Drum – Kids everywhere will love this amazing Civil War style marching parade drum made by a prestigious drum company who actually made drums used in the Civil War! The high quality, metal drum replica is designed after the drums carried by American soldiers and features a bright, dazzling blue color. The large drum resonates with a deep, crisp sound. The drum has durable polyester drum heads with metal rings on a metal frame with a rope and leather “Cord & Ear” tensioning system. 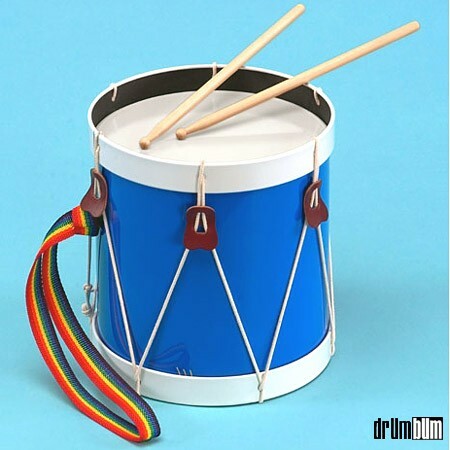 A great play drum or marching drum for kids 3 and older. Includes two child size drumsticks and Rainbow neck sling. Lightweight. White & Blue Colors. Made in the USA! Approx 10.75″ x 10″. *Please Note: Due to the size of this item, orders with multiple Kid’s Marching Parade Drums may be subject to additional shipping fees.Shipping to Contiguous USA only. Drum Gifts for Children at DRUM BUM!